WordPress Website Development: how to do it right? You are here: Homepage » Blog » WordPress Website Development: How to do it right? The WordPress is the most favourite open-source content management system for blogs and websites today. The WordPress website development is very easy. The system itself is free and the documentation is simply great. Wikipedia says that WordPress is being used in more than 12 % of the internet worldwide and overcomes competitors such as Joomla or Drupal. WordPress Website Development – how to do it right? I will not write about a WordPress installation, which hosting is the best etc. I assume that you have some WordPress website and you want to redesign it. However, you want to maintain plugins and content. After couple of mistakes I created my own method how to do it. The most important thing is you don`t have to code online but safely on your home computer (even without the internet). How to do it? Install the WAMP (a free tool) that creates the environment on your home PC that contains Windows, Apache HTTP server, MySQL and PHP. That is all you need for WordPress installation on your home PC. The WordPress installation process is described here. When installed just run the WordPress as localhost and you can start creating the website. To transfer the website content (pages, posts, comments…) is just a piece of cake. 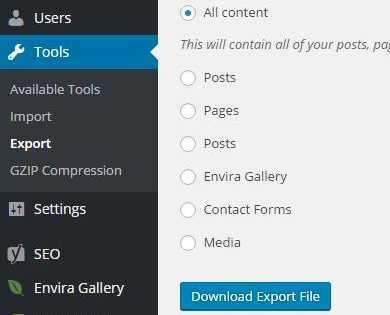 Just click Tools in Admin menu on your original page, choose Export and tick the choice for the whole content. 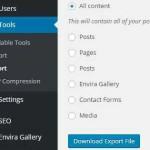 The newly created file import using the same procedure to the website you locally create. Done. No matter whether you create website using template or “from scratch”. The process of going online is easy. 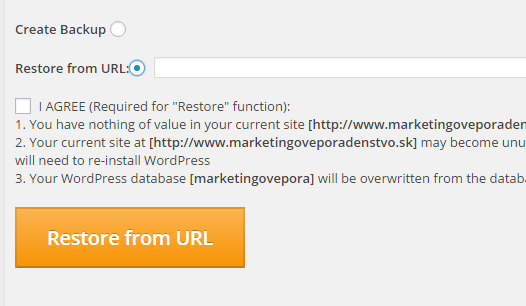 Just install the WP Clone by WP Academy plugin to your newly created website (that one on localhost). Choose Create Backup and create the site backup. The same plugin install on your original page and create the backup as well. The backup of newly created website store on Dropbox into Public folder and copy public link (important – if the file is not in the Public folder it may not work). 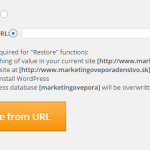 Put the link in the WP Clone by WP Academy plugin to Restore from URL choice on the original page you want to change. Just confirm and it`s done. Simple as ABC. ← How to share video without upload to youtube? I agree with you.. WordPress is most popular content management system.. It’s really easy to use web developers and seo for blog..